1. 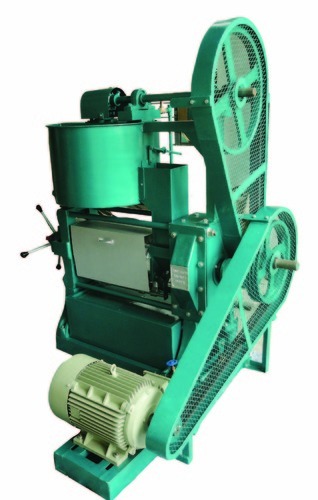 Decorticator has special provision for shelling groundnut for seed purpose without breakage. 2. Yield of oil is as high as big mills because of highly scientific worm sequence inside the chamber cage. 3. Maintenance expenses are negligible. 4. Technology is so simple that person can be trained only in 2 days to operate the mill. 5. Video cassette is provided with every mill to explain operation, maintenance, names of components, dismantling, assembling etc. 1. Our oil expeller is unique in the world. We have developed this oil expeller in collaboration of German NGO called FAKT. Salient features are as under. (1) Our chamber cage is closed by clamps weighing only 1 kg per clamp. Such 14 clamps hold 2 halves of the chamber cage tightly together. This is unique invention only in our oil expeller. All other expellers of the world have long studs inserted on heavy horizontal clamping bars of square section which weighs almost 60 kg. So in our oil expeller only 14 clamps work far better than clamping bar system of heavy weights.
) (2) Our expeller has a facility to open and close the chamber cage without lifting any heavy weight. All expellers of the world require lifting almost 120 kg of weight while closing the cage and also while opening the cage. We have devised our chamber cage to open the cage on hinges without lifting any weight. This is unique system in the world. 3. (3) Our oil expeller has facility to change thickness of oil cake while running of expeller. All expellers of India have to be stopped 3 to 4 times for changing the thickness of oil cake from 10 mm to 3 mm. So this is also unique facility in our expeller. 4. (4) Oil pump for filter press is integral part of our oil expeller. All other expellers have to run filter pump by belt which is separately installed with separate foundation in the ground. 5. (5) We have unique system of readymade foundation frame on which oil expeller and electric motor is mounted and hence no foundation to be dipped in the ground. Most of the Indian expeller requires foundation in the ground which takes 7 days curing time before starting oil mill. Our expeller starts in 2 hours only. (6) Design of our expeller is sturdy and heavy. So there is no chance of breakage of any component. So you can run the expeller at higher RPM of the main shaft. It means higher production. 6. All above facilities have been developed during collaboration with Germany which continued for 5 years for upgradation of technology. Hence our oil expeller is unique throughout the world. (1) Chamber cage 22' x 4'. (3) Suitable for every kind of oil seeds. We, Tinytech Plants from 1994 are one of the foremost Manufacturers and Exporters an extensive array of Industrial Processing Equipment. Our offered range consists of best grade Edible Oil Mill Machine, Solar Cooker, Jaggery Plant, Water Tube Boiler, Solar Water Pump, Copra Cutter, Bio Gas Plant, Palm Fruit Stripper, Steam Power Plant, Potato Chips Making Machine and much more. To manufacturing these products, we use top quality components. Our products are appreciated for their features like easy to use, low maintenance, crack resistance, long service life and lightweight. Additionally, we are offering these products at very reasonable rates. Also, these offered products are used in various food processing industries.